How Much Do Tattoo Artists Make? Tattoo Artist Salaries - How Much Do Tattoo Artists Earn? The tattooing business is a wild and diverse world. It runs the gamut from bearded biker types tattooing out of neon-lit corner shops, to celebrity tattoo artists profiled in reality shows. Though not a lot of people know how much money tattoo artists earn at either end of that spectrum. Is it a profitable career worth pursuing, or a modest one that’s only for the truly passionate? Plus, if you want to become a tattoo artist, what does it take to become one of the high earning ones? How Much Does a Beginner or Apprentice Tattoo Artist Make? How Much Does an Experienced / Intermediate Tattoo Artist Make? How Much Does a Highly Experienced Tattoo Artist Make? What Factors Determine a Tattoo Artist’s Salary? If you’re hoping to break into the tattoo world and immediately earn a comfortable living, I’d sit down before reading this part. It’s a tough road to becoming a tattoo artist, with lots of time, sweat, investments, and paying dues. One of the hardest parts of it is that tattoo apprenticeships (which will be your first one or two years pursuing this career) pay nothing. That’s right, apprentice tattoo artists usually make zero dollars until they’ve finished their training, acquired a license, and started working more independently. It’s even harder on the wallet than that, however. While you’re earning nothing, you still have to pay for your tattoo machines and equipment, and you probably have to pay for your apprenticeship, too (costs vary, but expect it to be in the thousands as well). You can think of apprenticeships as tattoo school. There’s no formal education involved in tattooing (unless you decide to go to art school first), so working as an apprentice is basically like paying to attend a college or technical school. Once you complete your apprenticeship and get your license, you can start earning a living with your craft, but just how much can you expect to make right out the gate? The earning potential of entry-level tattoo artists varies because they get paid for the amount of work they do, rather than earning a wage. That being said, tattoo artists just starting out can expect to earn between $15,000 and $23,000 a year. Once you’ve been in the business a while, you can start earning a few thousand more per year. Again, we’re dealing with a range, but the PayScale website places the median annual earnings for tattoo artists at about $30,000. The more fortunate ones in this category can earn as much as $40,000. Those aren’t extravagant earnings, to be sure, but they make for a much more comfortable living than you’ll earn as a beginner. To give you a good sense of how much income highly experienced tattoo artists typically make, we’ll exclude the outliers. 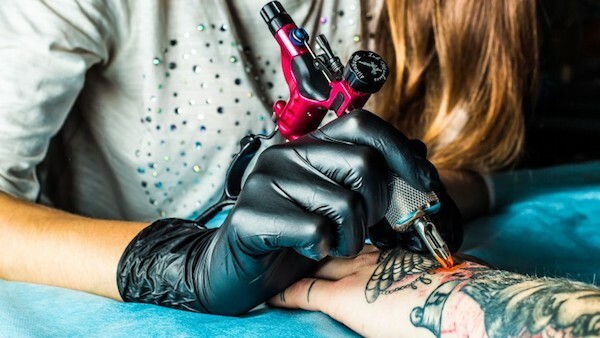 The people who tattoo celebrities and millionaires (or who are celebrities themselves) can charge up to $1,000 per hour for their work, but what about other highly experienced tattoo artists? When you get to this place in your career, you can expect to earn somewhere around $80,000 to $150,000 a year. All of those figures are ranges, and each of them has outliers. For example, some (but very few) intermediate tattoo artists can earn as much as highly experienced ones. Conversely, some of them will earn about as much as a beginner. That’s because working as a tattoo artist isn’t like working at a traditional job where your earnings are based on your job title and your level of seniority. A lot more factors go into determining your salary. Here are the major ones. Tattoos are works of art. That means our customers aren’t just hiring you for your labor, your equipment, and your training – they’re hiring you primarily based on the quality of your work. The better your art, the more skillful your tattoos, and the more elaborate and detailed your work, the more you can earn from it. The tattoo artists who make a killing aren’t doing it just because they’ve been working at it a long time. They’re earning as much as they do because their art is spectacular. Until you reach that high level of skill, you won’t be able to charge a premium for your work. Part of your income will also be in the form of tips, and your customers will tip more generously the better your work is. The location of your studio makes a big difference to how much money you can pull in. The level of affluence in your area can limit how much people are willing or able to pay for a tattoo. If you’re a tattoo shop in a small town, you might never be able to charge the high rates that some Los Angeles and Manhattan tattoo artists can. On top of that, you need a large pool of customers to earn a good living, and there might not be a lot of business in a smaller city. Being a popular tattoo artist ensures that you get a steady stream of customers. If you can earn a good reputation or a large following on Instagram, you could find yourself with a long waiting list of customers. With no shortage of work, you’ll be able to get a decent amount of regular income. Plus, if you’ve got customers trying to elbow their way into your chair, you’ll be able to charge more per job without losing your clientele. Contrarily, if you haven’t made a name for yourself and you haven’t found a way to master social media, you might be constantly hustling for new customers or pushing the broom around the studio hoping more customers show up. As you can see, there’s a theme here: the more work you can do in a year, the more you’ll earn. So, your speed matters. No matter how many customers you have, you will only be able to earn so much if you work at a snail’s pace. If you can work quickly without compromising quality, your earning potential will go up. Being fast enough to do even two or three extra tattoos a week can add up and make a big difference to your annual income. Now, technically, this isn’t a factor that affects how much you can make as a tattoo artist because it really affects how much you make as a business owner. Obviously, if you work in a tattoo shop, you’ll earn less than you would if you owned the shop. This is due to the fact that it is unlikely you will be taking home 100% of the cut. Most tattoo shops are owned by tattoo artists who have either stopped tattooing, are tattooing part time, or manage to balance both aspects of their work. It can be a good career move for experienced tattoo artists who are looking not only for a higher income but long-term stability in their earnings. Tattoo artists earn anywhere from $15,000 to $80,000 a year, and a lot of factors go into determining where you’ll fall in that range. The biggest one is how much work you can get. Your location, speed, and popularity (or lack thereof) will have a big influence on whether you’re tattooing a revolving door of customers or spend half your time sitting around waiting for someone to come by the shop. All in all, tattoo artists don’t start off making a huge amount of money, but if you’re patient and work diligently, you can eventually reach a point where you’re earning a decent income from your art.